Longtime readers will know that I am a big fan of Brian Keene. Recently, he offered a limited set of signed editions through Maelstrom, his new imprint at Thunderstorm Books. I, of course, ordered them and was excited to receive my shipment earlier this month. As a bonus, the package also included a signed, numbered edition of the Kelli Owen’s debut novel – “Six Days”. Not being familiar with Owen’s work, I had no idea how much of a bonus the book would end up being. 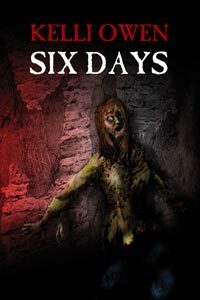 “Six Days” opens with Jenny Schultz opening her eyes to complete darkness. She has no idea where she is, why she is there, or what is happening. Alone in the dark, it takes her a moment to realize that she’s not blind and she’s not still asleep. After a bit of exploration, Jenny finds that she is in some sort of cellar – then comes to an inescapable conclusion; she has been abducted. The genius of the book for the reader is that, just like Jenny, we are left in the dark to discover what situation she is found in. Owen resists the urge to explain the cellar to us in great detail – instead deciding to reveal it piece by piece, just as Jenny experiences it. Nor do we immediately understand why Jenny is in the situation she’s in, or who put her there. It’s a smart move on Owen’s part and serves to create a claustrophobic cocktail of unease and uncertainty. In today’s world of omnipotent narrators and worn out horror clichés, it’s refreshing in a very Chianti and fava beans sort of way. As Jenny works her way back through the events of her life, both distant and recent past, we begin to see a picture of a strong woman who nonetheless has her share of baggage. Just as Jenny explores the underground prison she finds herself in, we explore the dark corners of Jenny’s life through a series of her memories, developing an understanding of the dimensions of her character. While reading, I couldn’t help but think of this book as the dark, evil twin of another book I read last year – “Dying to Live” (you can check out my review here). Owen has a very polished writing style for a debut novel. Her prose is crisp and informative – with flashes of everyday insight that at times stopped me in my tracks. She feared going into her own room to see the loss – the yearbooks would be gone, the photographs of and with friends, the various concert and movie ticket stubs, her life. Her childhood was now nothing more than her own memory, no proof of its existence remained in the shell that was once her house. You can tell she’s a fan of horror and understands the difference between a cliché that should be avoided and one that can be constructive. Her protagonist, Jenny, is a very self aware of the situation she’s in and views it through a real world lens, not a literary one. She thought of every movie or book she’d ever run across which featured a trapped woman. They never ended well, and she’d always believed it had everything to do with the choices they made along the way. When they should scream, they whimpered. When they should run, they froze. When they should attack, they cowered. Whether it was for dramatics or storyline, they always seemed to do the wrong thing. Occasionally, even the men she had seen in similar situations fell victim to “wrong place, wrong time.” Jenny promised herself she wouldn’t make those mistakes. Is “Six Days” a perfect novel? No. Seasoned horror and suspense readers will be able to follow the breadcrumbs (or body parts, as the case may be) to the identity of Jenny’s captor before the novel’s conclusion – but this doesn’t detract from the story or the atmosphere that Owen is able to create. The ending is not all that I hoped it would be, but I can look past that, given how much I enjoyed the journey to get there. No problem – I’m glad that I had a chance to read and review it. She did a great job. I remember listening to an interview Owen did on the Funky Werepig, discussing this book–I think Keene even called in to put it over–and it sounds very promising. It’s one I’ll have to keep an eye on. Nice review.